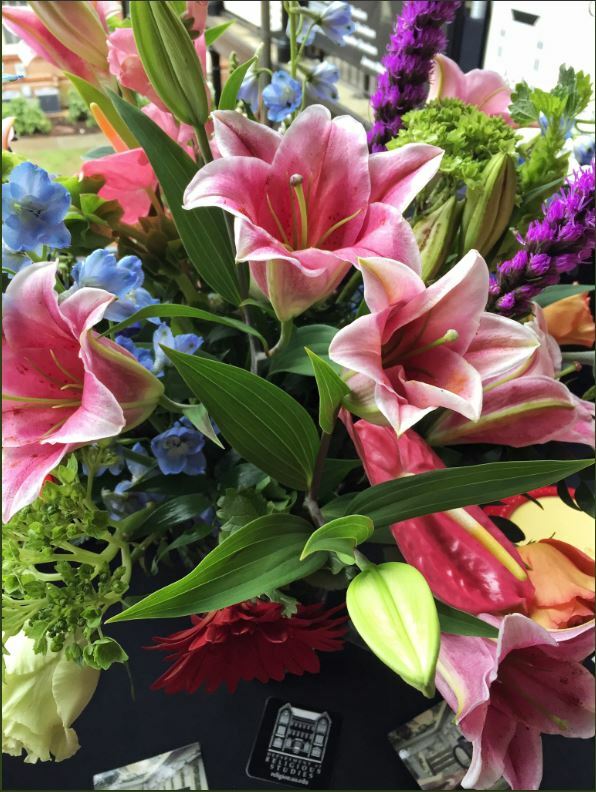 Prof. Emily Crews shared an image of the decorative flower arrangements on twitter. The bouquet continues to bloom and has brightened the Main Office since the end of the event. 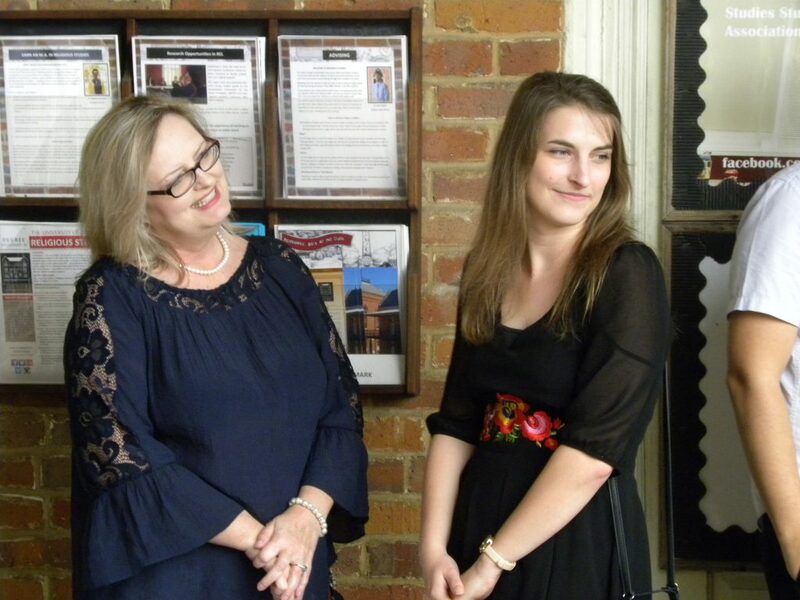 Pictured above is first-year graduate student, Caity Bell, with her mother as they wait for the awards to be handed out. 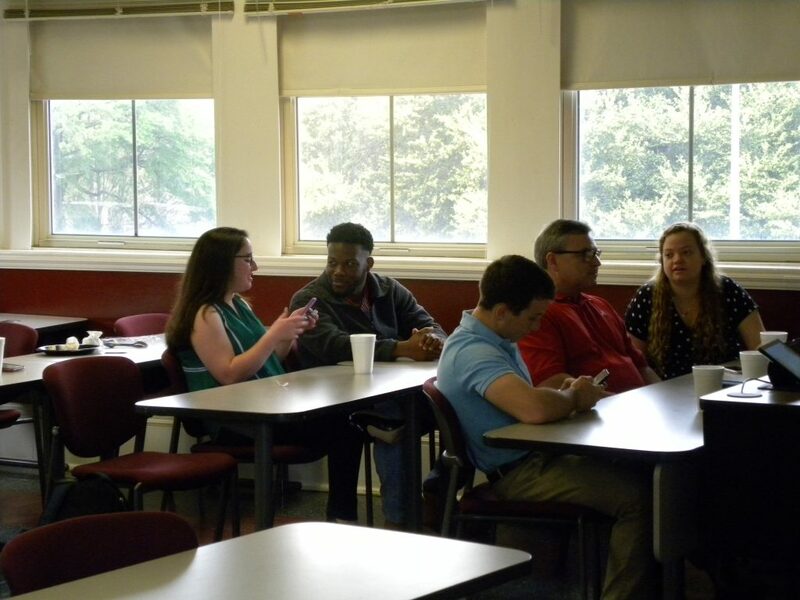 Several students enjoying refreshments while watching a slideshow of events in the Department from the past year. 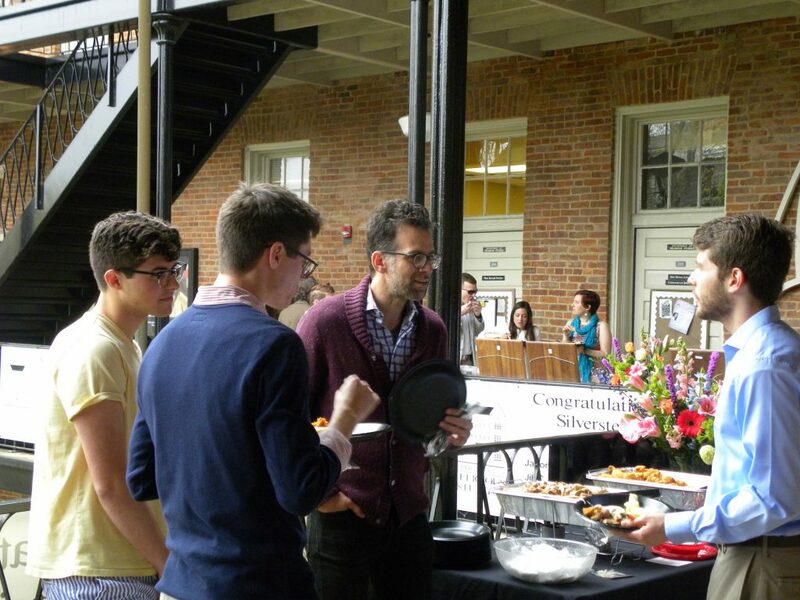 Prof. Emily Crews makes her way through the food line with friends and family members of students being awarded. Prof. Nathan Loewen chats with several Religious Studies undergraduate students before they are honored. 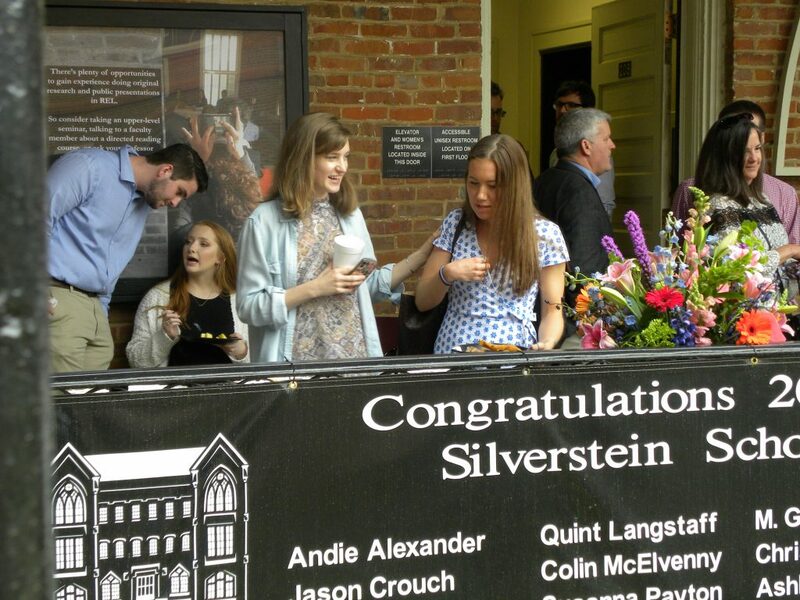 Friends and family applaud as Jade Teel accepts one of the Silverstein Scholar Awards from Prof. Mike Altman. 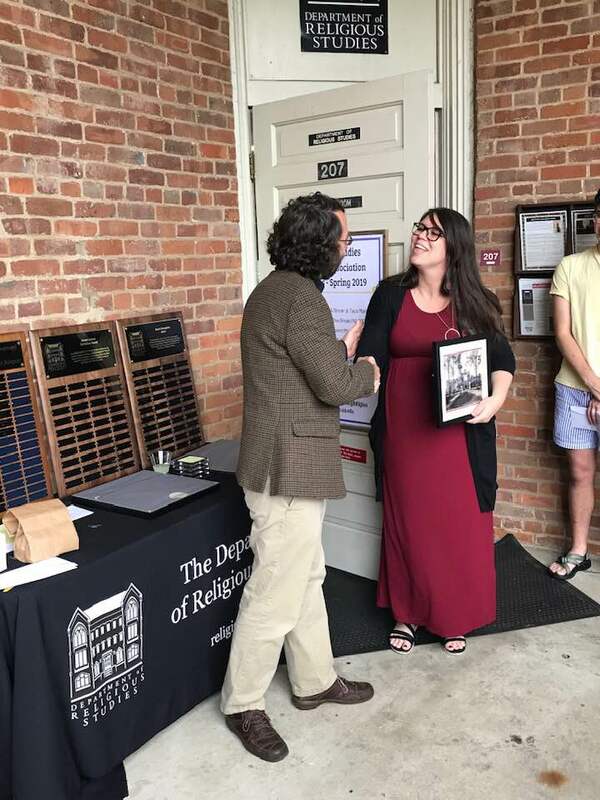 Religious Studies Senior, Ellie Cochran, is recognized for her work as the Religious Studies Students Association President by Prof. Richard Newton, the faculty member in charge of the student organization. 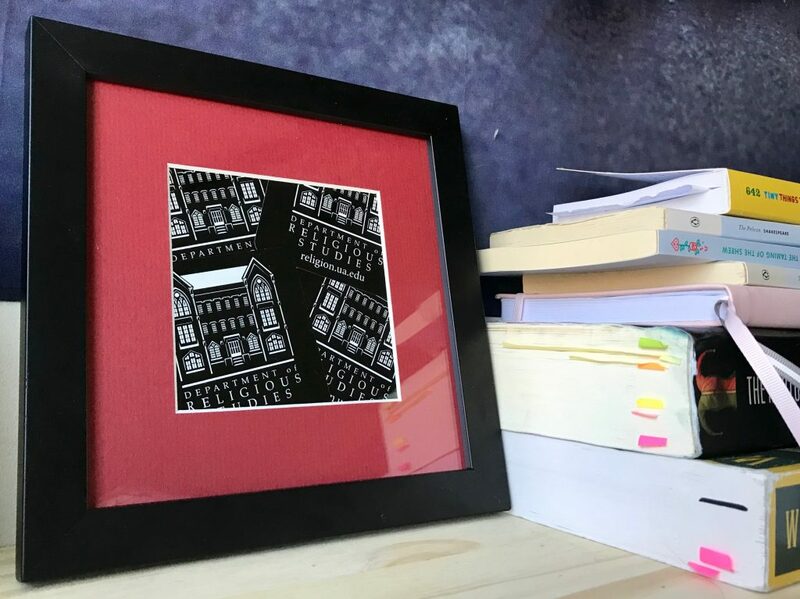 Each RSSA Officer took home handmade collages of the REL stickers they planned and created with the help of Prof. Newton at the start of the year. Sierra Lawson receiving the Ulysses V. Goodwyn Graduate Student Award from Graduate Director Prof. Merrinda Simmons. 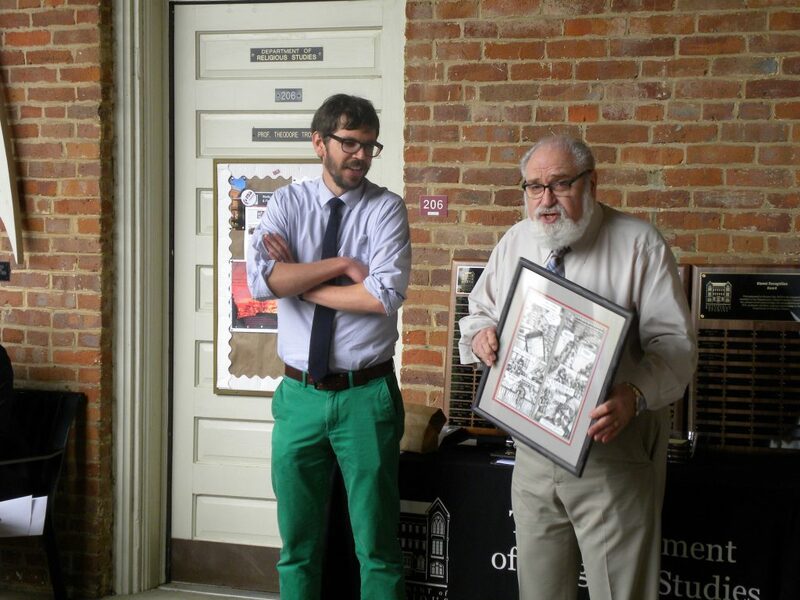 Prof. Steven Ramey recognizes new faculty members, including Prof. Richard Newton pictured above, with a framed historic photo of Manly Hall. 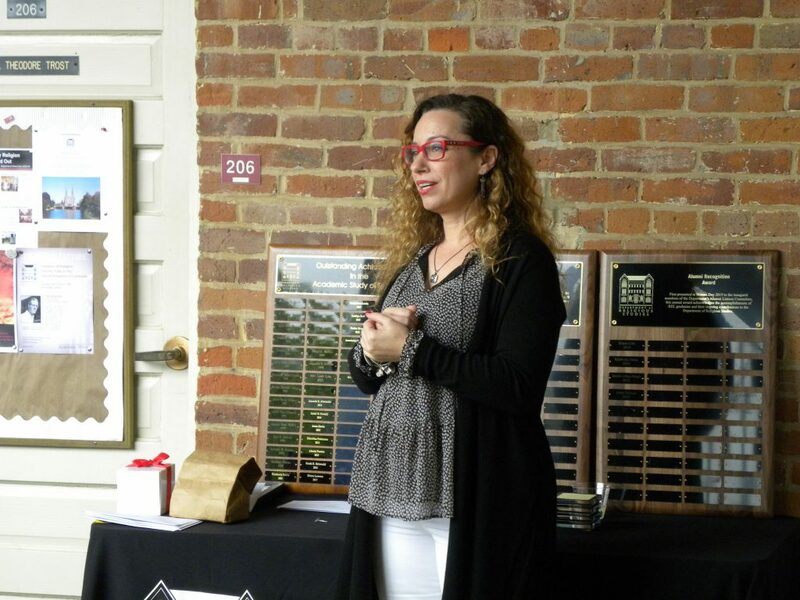 Prof. Emily Crews, who also joined the Department as a faculty member this year, was recognized by Prof. Ramey as well. Graduate students Sierra Lawson and Caity Bell pose for the camera. Both attended the University of Alabama for their undergraduate degrees and have a long history within the Department of Religious Studies. 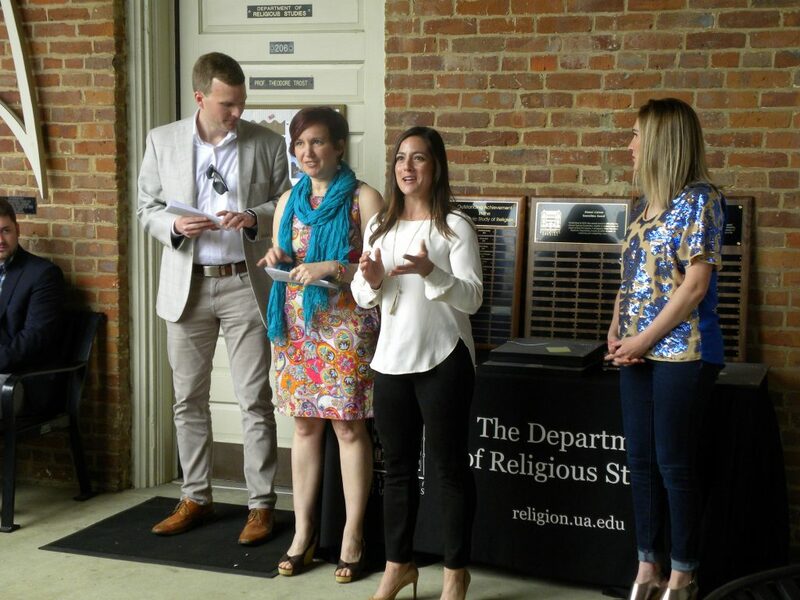 Prof. Vaia Touna presents the newest award, recognizing members of the Religious Studies Alumni Committee for their continued involvement in the Department. 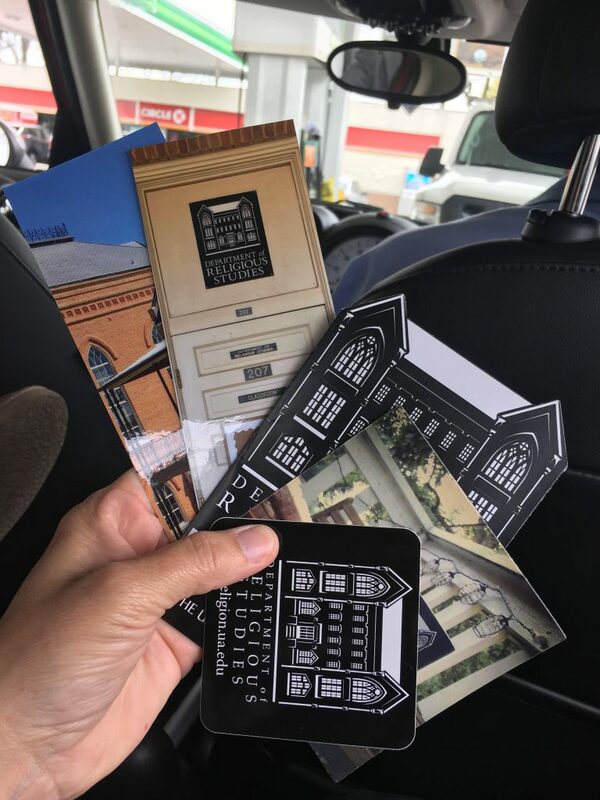 Prof. Touna worked closely with the four alums to plan events this year, like the first annual Homecoming Tailgate and two Grad Tales events. 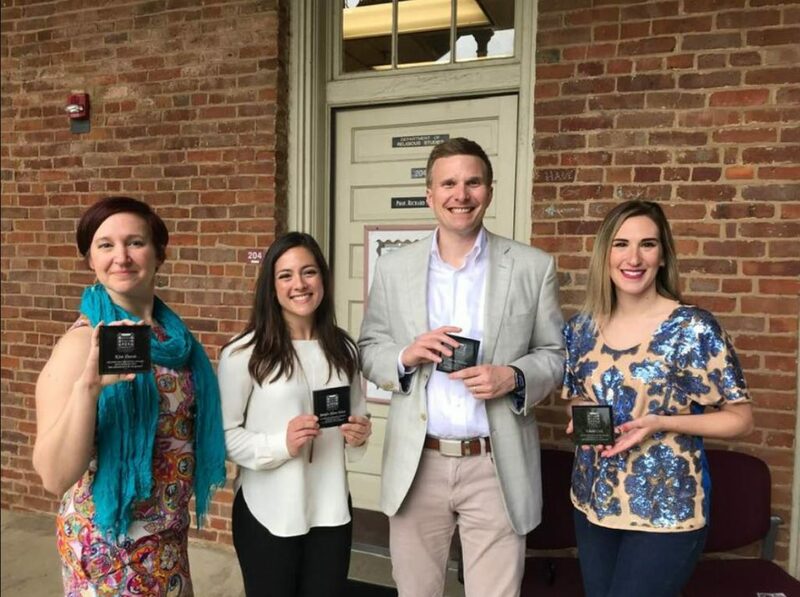 Religious Studies Graduates (Kimberly Davis, Jennifer Alfano Nelson, Justin Nelson, and Khara Cole), after being honored as the first Alumni Liaison Committee cohort. From planning a Homecoming Tailgate, reviving the Grads Tale event, and hosting career workshops, the Alumni Liaison Committee has stayed busy this year. As part of a new initiative, the group asked undergraduate students to share their unique experiences with religious studies in a short written work. 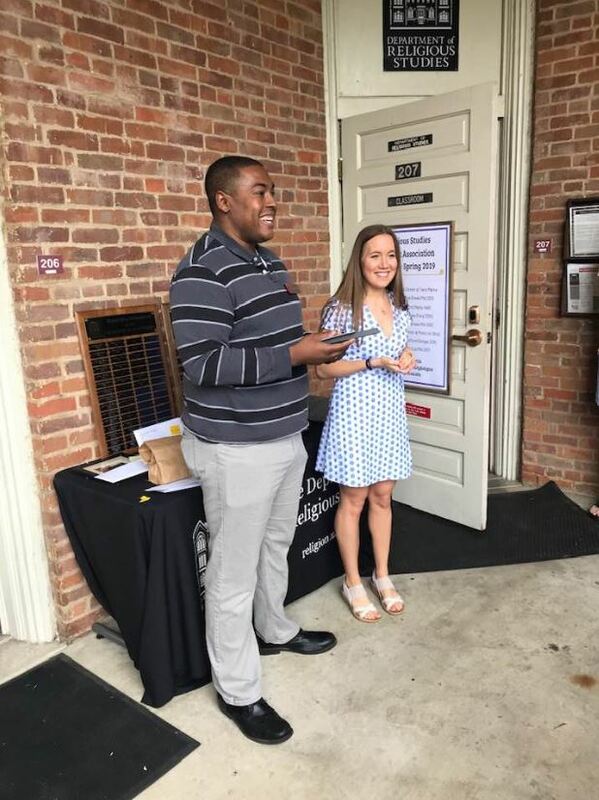 As a result, eight students ranging in their academic careers were nominated to share their stories in a pamphlet that will be distributed across campus and mailed, along with the annual newsletter, to previous REL graduates around the nation. 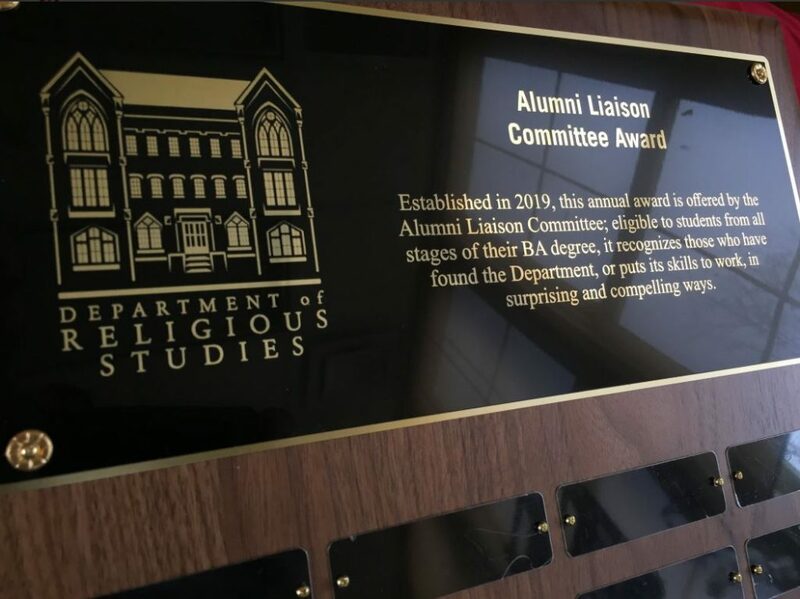 This new award established by the Alumni Liaison Committee recognizes undergraduate students who apply their humanities education in innovative ways. 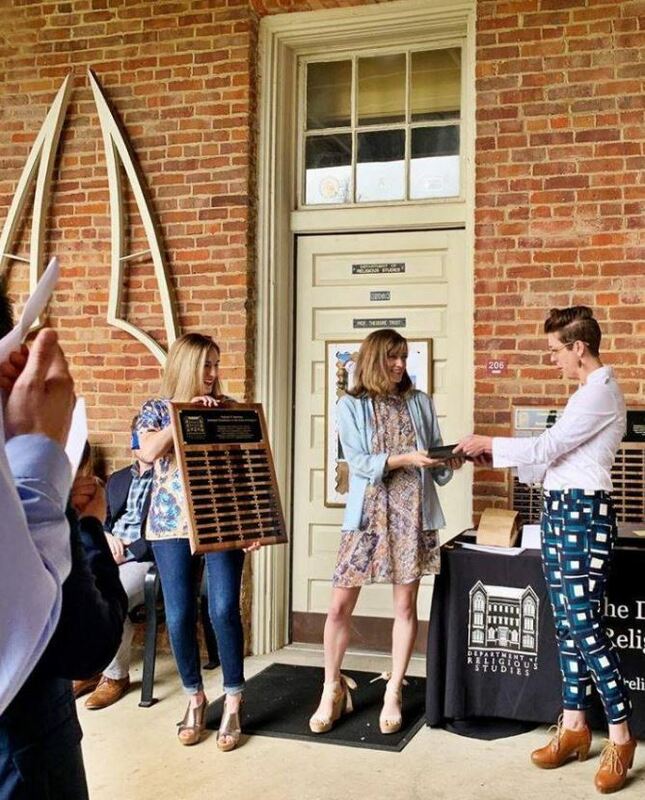 The students nominated for this honor included: Savannah Aldridge (sophomore), AnnaLaura Campbell (Junior), Ruth Hallstead (sophomore), Abby Hubbard (Junior), Jeremy Lindlan (junior), Reya Sison (freshman), Anna Catherine Snyder (freshman), and Jade Teel (senior). 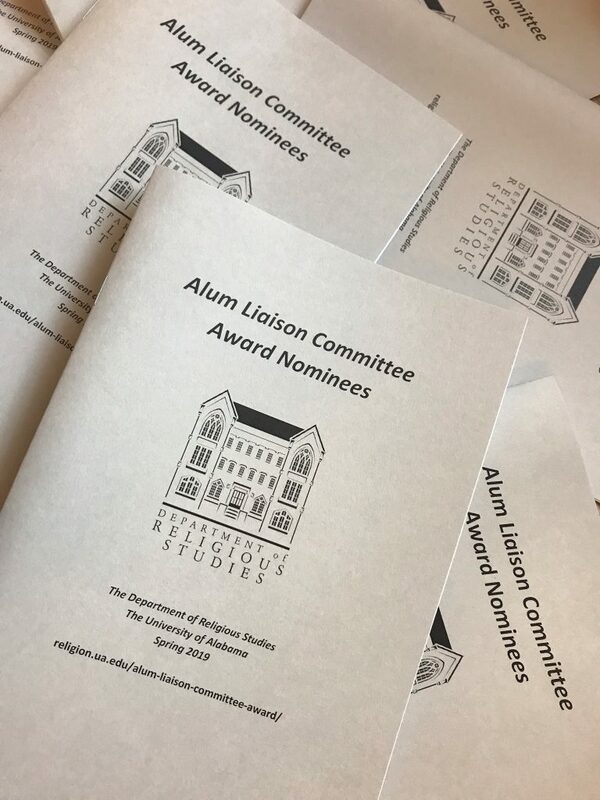 Each student nominated by the Alumni Liaison Committee is featured in booklets to be shared with both current Religious Studies students and those who have graduated from the program. 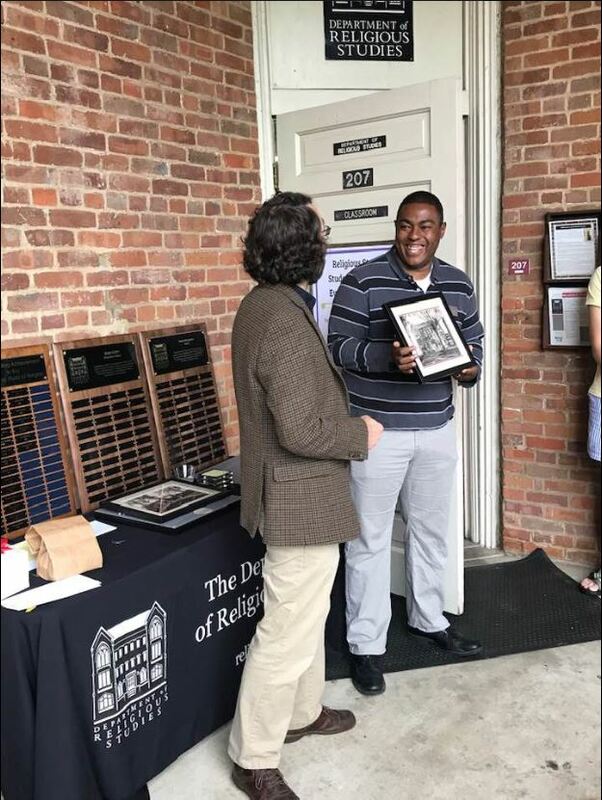 Religious Studies Major, Kyle Ashley, was recognized as a Silverstein Scholar, an Outstanding Student, and for his position as Treasurer of the Religious Studies Student Association. 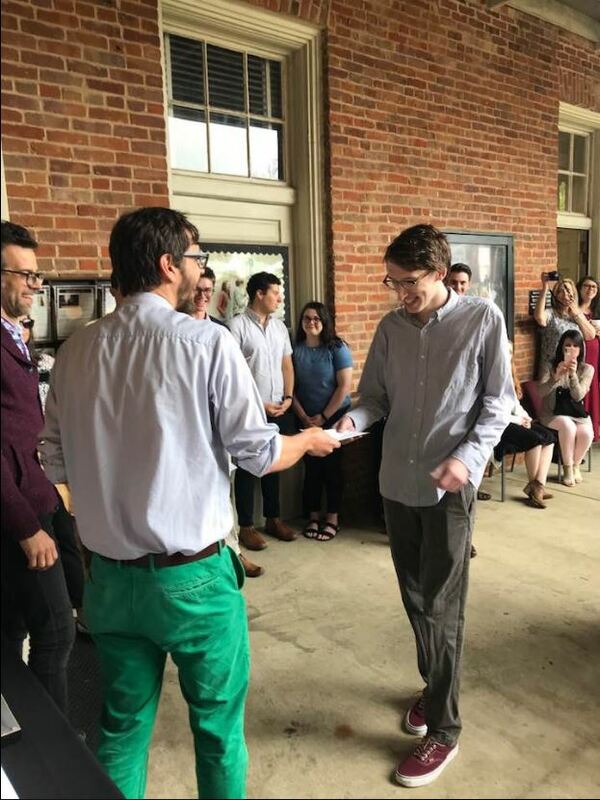 Prof. Jacobs congratulates Prof. Altman for receiving tenure (effective August 2019) after joking that he no longer needs to wear a tie around Manly Hall. According to Prof. Jacobs, neckties need only be worn by young men constantly on the lookout for work. Prof. Altman’s new position will keep him around the department a while longer, whether his ties stay in the closet or not. 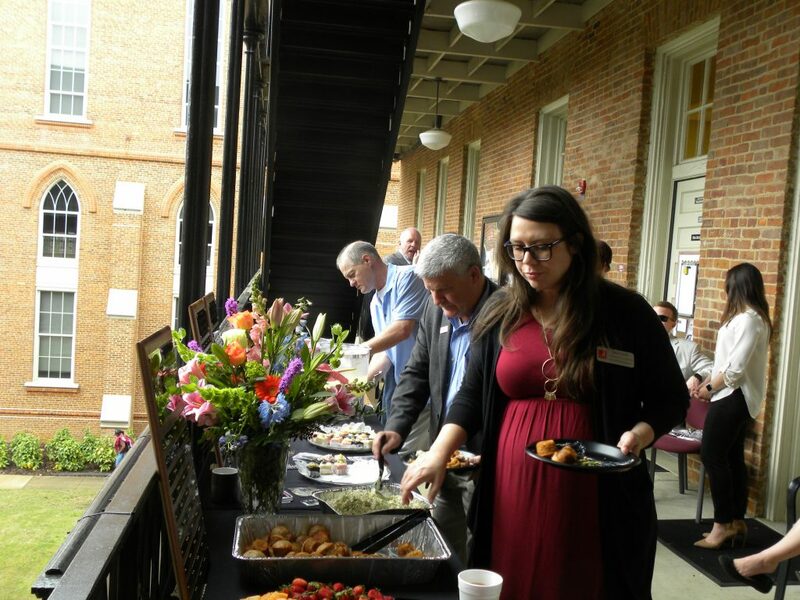 After the Arts & Sciences Honor Ceremony ran late, Ellie and other guests were unknowingly trapped in Manly 207 while eating. 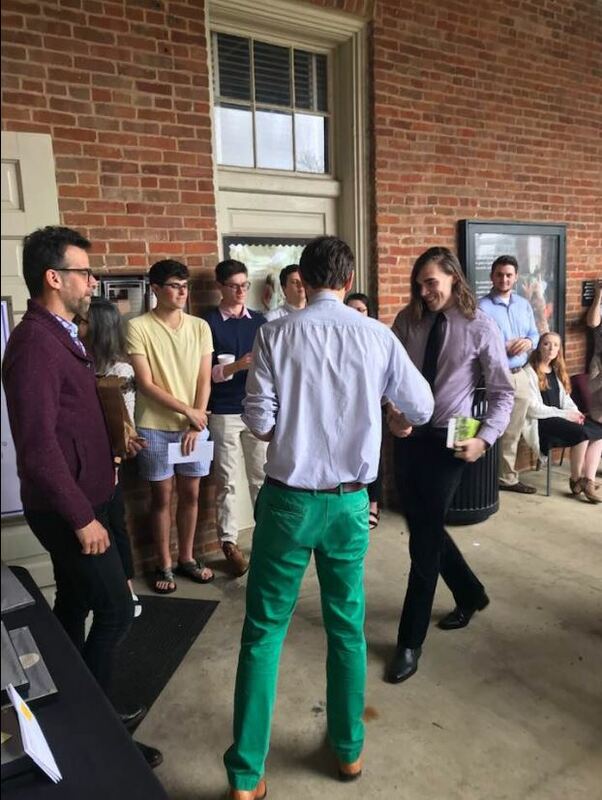 The crowd of spectators circling the length of Manly Hall left the group cornered, creating several dramatic entrances as they jumped out to accept awards and snap photos. 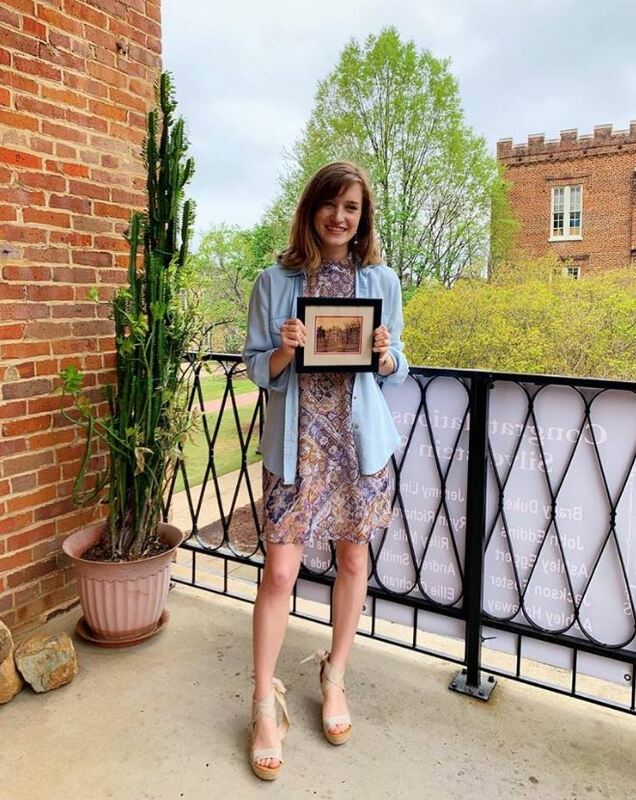 Second-year graduate student, Sierra Lawson, poses with her gift from the department: A framed historic photo of Manly Hall. Next year she’ll begin a Ph.D. in the study of religion at the University of North Carolina at Chapel Hill. 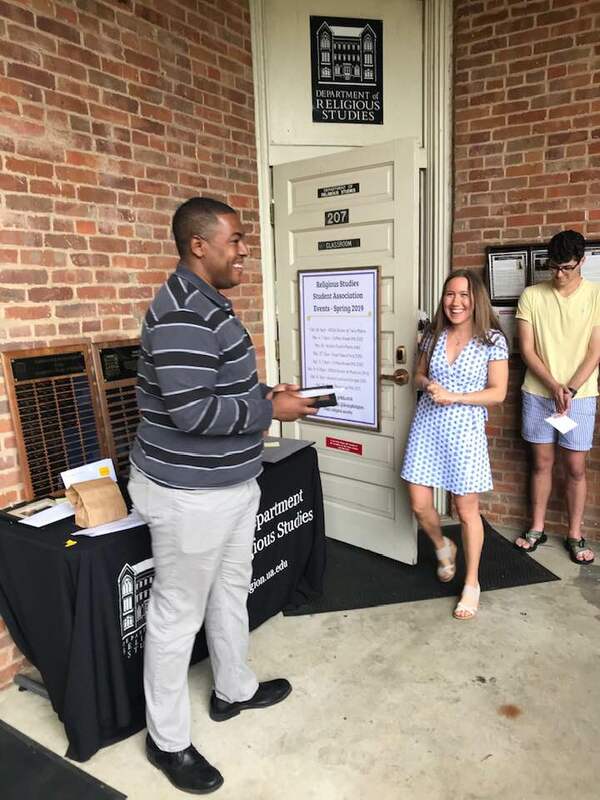 Religious studies undergraduate student, John Eddins, is recognized as one of the 2019 Silverstein Scholars. So that’s a wrap on Honor’s Day 2019! Swing by the Lounge to see the newest additions to each award plaque and grab some leftovers. 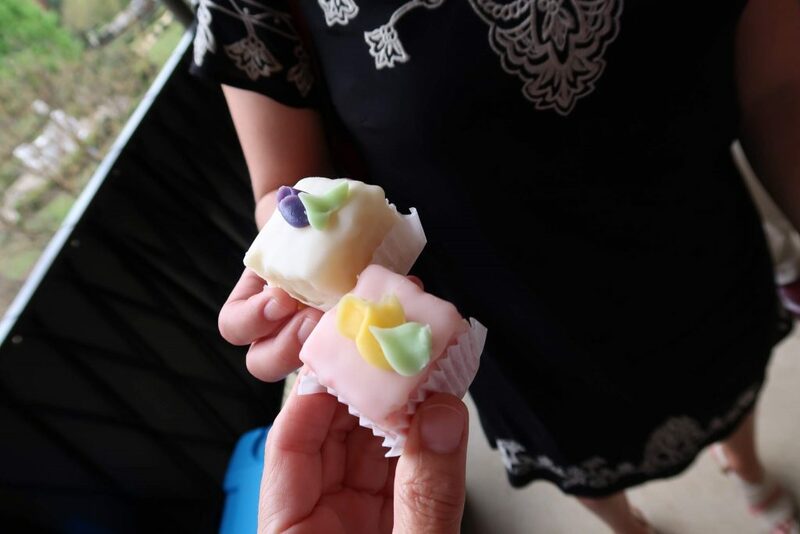 The Department of Religious Studies is already looking forward to Honor’s Day 2020 and all that the upcoming year has in store. 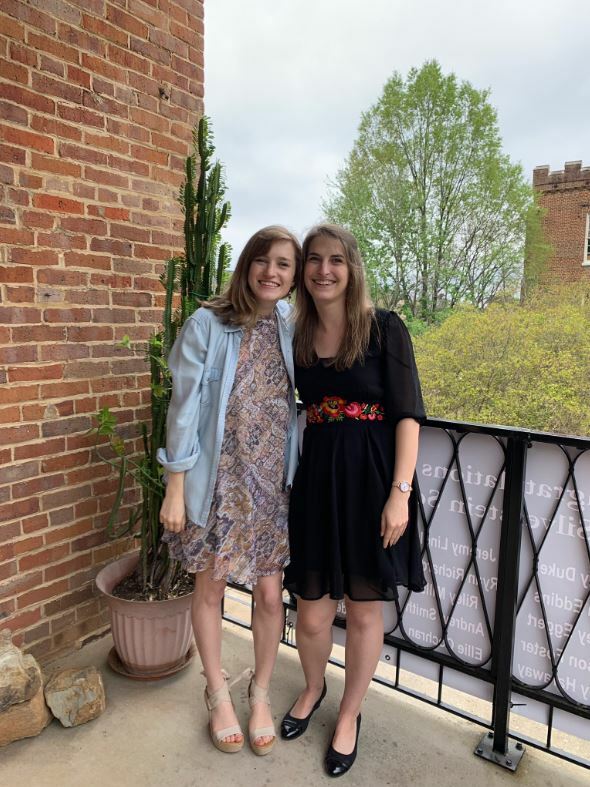 Check out the Look Back on 2018-2019 slideshow that student worker, Ellie Cochran, put together for the event. 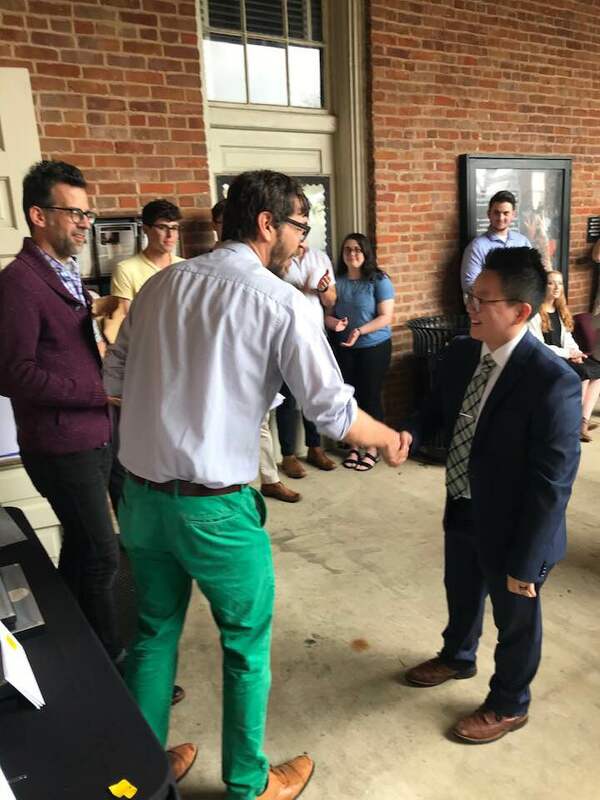 This entry was posted in Faculty Blog, Public Events and tagged Alum Liaison Committee Award, Award, Honors Day, Honors Day 2019, Outstanding Student Award, Religious Studies Student Association, RSSA, Silversein Scholars, Ulysses V. Goodwyn Graduate Student Award by Morgan Frick. Bookmark the permalink.